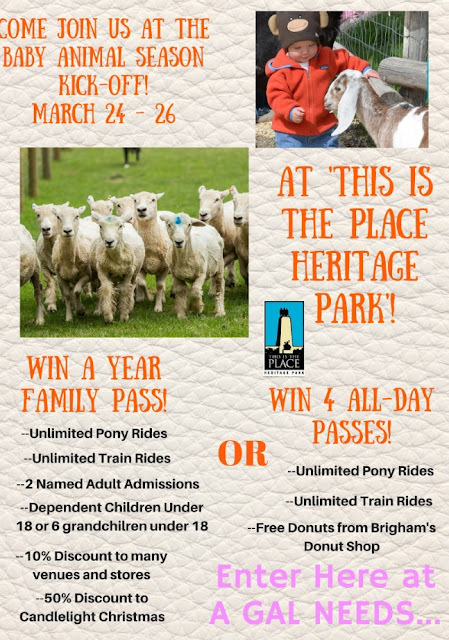 Spring is officially here and baby animals are everywhere on the farm at 'This Is The Place Heritage Park'! One of many season events, Baby Animal Season is one of the most thrilling for visitors of every age! It's so much fun to see all the baby animals and pet them, feed them, and learn about them. Mention A GAL NEEDS...at the ticket office and get $2.00 discount per ticket! We are so happy to partner up with 'This Is The Place' in Salt Lake City and give away 2 awesome packages, just in time for this eventful season! Enter in the Rafflecopter below. If you have won something from 'This Is The Place' Park in the last 12 months, you are not eligible to win! Good Luck!